I can’t match their love for me. Today we had 4 oratorical contestants give their speeches. The contest was started in 1928, which means this year, 2018, is the 90th anniversary. We have named our contest the “Margaret Barclay Memorial Oratorical Contest”. Margaret Barclay was the committee chair of the contest for many years and a past president of our club. Margaret was a longtime teacher and the principal of Magsig Middle School. Her husband, Roy Barclay, still generously sponsors the financial awards for our contestants. He spoke to us for a few minutes and it was great to hear about his wife and her service to kids, Centerville and the CNO. Margaret was an integral part of creating new Alpha and Junior Optimist Clubs in our schools and an active member in both the CNO and Springboro Optimist Club. Margaret valued this community as well, serving as an Elder at Southminster Presbyterian Church and a Charter member of the Centerville Education Foundation. Speaker A, roots of optimism are: Attitude, Associations and Action. She referred to them as her triple A’s. Remember, be positive, those you associate with are important and actions are more important than ideas. Speaker B, roots of optimism are: confidence, positivity and hope. She reminds us to give others you might typically disregard a chance. Speaker C, roots of optimism come down to choices; you can choose to be positive, happy, and friendly. You can also choose to forgive, exercise and reduce stress. Speaker D, roots of optimism are being goal oriented, having faith (she tries to pray every day), and to keep a good attitude. All four ladies did an amazing job in both content and presentation. Only one moves forward and that is speaker C. You are welcome to go and see the next round at the Centerville library soon. Heavenly Father, I’m all in! That’s fun to say if we were playing poker, but with head held at waist height, hands on knees you say that and everyone knows you’re spent, pooped, you gave it your all. Help us put the two together Lord. Help us want to come to you and say “I’m All In” every morning and repeat it at night with head bent over, with our hands on our knees, saying: “Thank you Lord — same time tomorrow?” Amen! 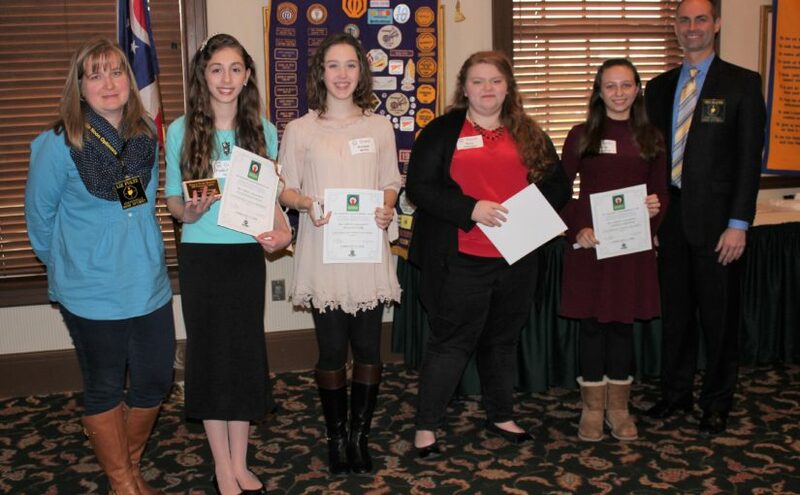 The girl’s had their turn with the oratorical contest today and all proved to be quite amazing speakers. Student “A” , Anna Lechleiter from Alter High School, stated that “each person should have a stamp of optimism on their heart and when they go through rough times, they are resilient and they push through”. She further stated “a true optimist is a altruist – void of selfishness” . Student “B”, Chandini Peddanna from Watts Middle School, reminded us that “not everybody can automatically be an optimist, because it’s like a muscle – the more you use it, the stronger it becomes”. 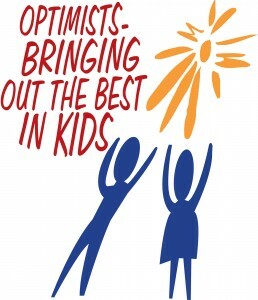 Student “C”, June Powell from Watts Middle School, said “optimism is critical for healing and is good for the immune system; while everyone gets down on themselves, remember to have positive thoughts because one good optimistic thought can change the situation”. 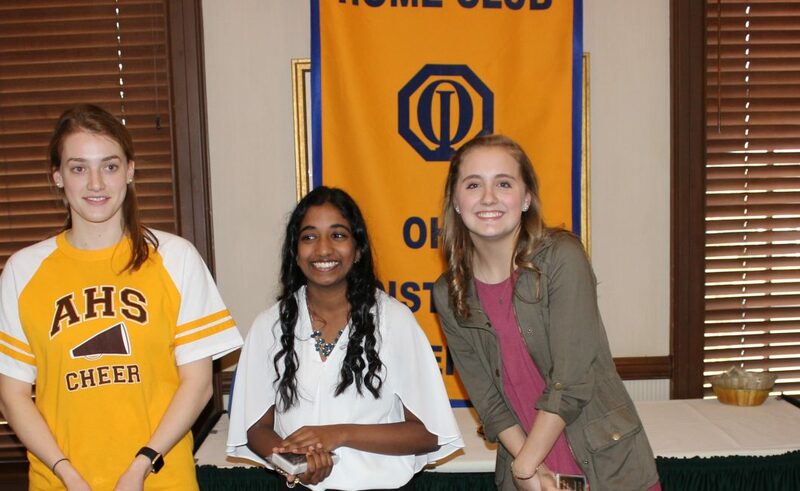 We want to thank all of the girls for their wonderful speeches on “What The World Gains From Optimism”, though a big congratulations goes out to Chandini on her win! She will compete with Benjamin Arehart in the final contest. Though there were no happy bucks or sergeantsBat arms today, there was a battle between the Gary’s (Smiga and Hansen) over a pair of UD basketball Tickets – donated to the club by Vince Reidy. The heated, yet short lived auction ended with Gary Hansen being the winner and paying the $30 to the club.